After a number of years as a successful software entrepreneur Tom now focuses his efforts on carbon mitigation. He's active in Cleantech venture capital, technology incubation & commercialization, and public advocacy. 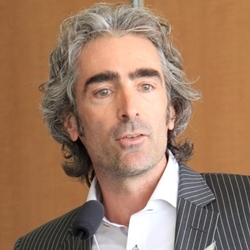 Tom is Managing Partner of ArcTern Ventures, a Senior Advisor at the MaRS Discovery District and sits on the board of a number of clean energy companies and organizations. Tom also developed Planet Traveler, a low-carbon hotel project in downtown Toronto. Tom's first book Kick the Fossil Fuel Habit was published in early 2010 (winner of the 2011 Whitepine Non-Fiction award) and his second - Waking the Frog - became a bestseller in Spring 2014. Tom holds a BSc in electrical engineering (U of Waterloo), an MSc in philosophy of science (University of London and LSE) and an MA and PhD in philosophy (U of Toronto) is an Action Canada Fellow, was recently appointed to the Government of Ontario’s Climate Action Group. Tom is a regular contributor on Canada’s leading op-ed pages and is a regular contributor on CBC’s On the Money.